Yangon is a perfect introduction of Myanmar`s culture: lively and vibrant. The city is dominated by shimmering Shwedagon pagoda, notable British Colonial Architects, exotic India town, appetizing China street foods. To define your luxury days in Yangon, make a visit to the mentioned attractions, immerse in an exciting cooking class and immerse in the comfortable Strand Hotel which reflects the rich history of Yangon. There are ways to appreciate the uniqueness of Myanmar. Taking a river cruise is probably the most intrigue option. A long journey from Yangon to Mandalay which takes about 10 days highlights your experience by highly personalized on-board services, interesting shore excursions. It is not mentioned that you will have chance to view the only Unesco Heritage site in Myanmar – The Pyu ancient city which is not accessible by road. Bagan is simply sublime. This holy plain is famous for its varied landscapes formed by 2,500 pagodas remain from 11th century. It is the most photographed site in Asia. The best way to appreciate Bagan is to embark on a Balloon, searching for photogenic chances. You will capture the gorgeous sunrises with bird eye panorama, floating on the air over the temple`s spire before sipping extravagant champagne. If you fancy to get closer to treasure of Andaman Sea then Mergui Archipelago is a place to start. You can expect much more than just beautifully sequestered beaches: incredible diving sites, picture-perfect fishing villages, hidden inland waterfalls, lush mangrove forests and fabulous coral reefs. 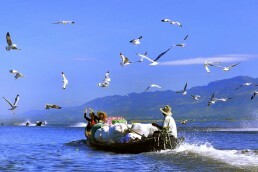 Inle Lake boasts undeniable romance. It is home to rustic stilt villages, green floating gardens and fascinating local markets. One of the hand-picked experience you should soak up in Inle is to enjoy a private boat, winding through its less-visited waterways. It allows you to photograph not only the dramatic nature of Shan State but also seeing the local life your own ways. Imagine you wake up in a private cottage over looking one of the most cascading waterfalls in north Myanmar. Dat Taw Gyaint is such a secret resort for your luxury treat. Activities guests particularly relish includes trekking to hill tribe villages, visit coffee farm or adventure to the hill station of Pyin Oo Lwin, one the best summer escapes in Myanmar. For a thrilling adventure designed to meet up your travel taste, Authentic Asia is a reliable local based agency to work with. You can contact them for a tairlor made tour or simply browse their Myanmar Tour Packages for further reference. Known as the Silver Beach, Ngwe Saung is the premier choice for those who seek for intimate moments for couples or family. Most of Myanmar Travel Experts recommend this beach for its gentle waves, world class resorts and importantly, it is not touristic. It is easy to pick a luxury resort where you can privatize your own piece of sandy beach. It does not mean Ngwe Saung is lack of activities to make your days occupied. Whether you are keen on water sports or cultural exploration, Ngwe Saung has them all.